Hi! 🙂 I’m Denise. 35 year old devoted wife and proud mother of three. My background is Education – B.S. from Howard University and M.A. from University of Maryland, Baltimore County. I am currently a stay at home mom. 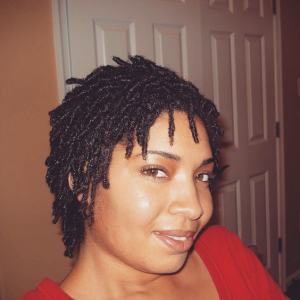 I’ve had locs for five years now. 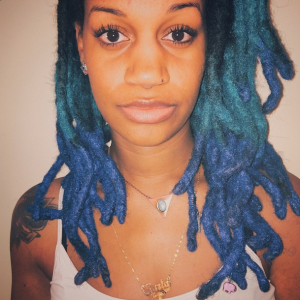 I started my loc journey with comb coils about six months after a big chop. 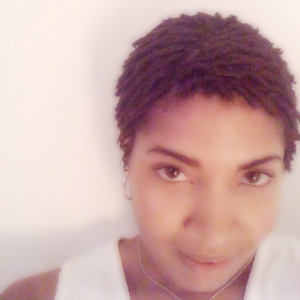 I’ve lazily combined many locs lol. 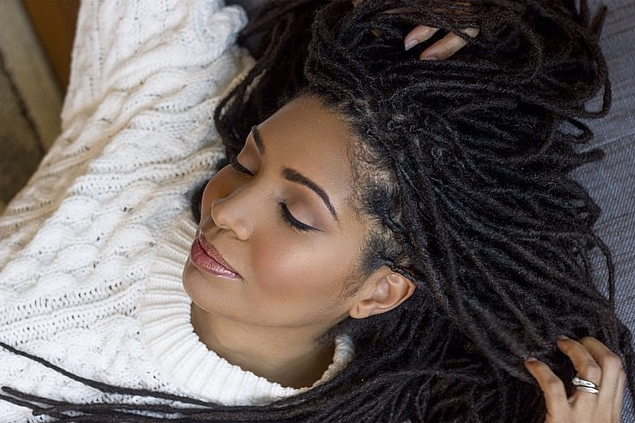 Starting off with my parts pretty uniform, I’ve learned that your hair grows thicker or thinner in different areas, so I have combined many to avoid thinning locs. I don’t know my exact number – somewhere around 250. I have so many. 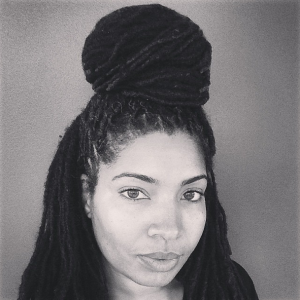 I’m inspired by people who boldly and freely rock their natural hair regardless of what others may think. 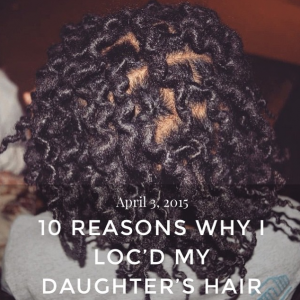 My 12 year old daughter is just starting her loc journey and I love that she is confident enough, at such a young age, to go against the grain and be herself. I’ve maintained my locs myself throughout my journey. There was a time when I retwisted every two weeks. Then again I’ve gone months at a time without retwisting. Right now I’m at a happy medium – about once a month. I have treated myself at times to a salon visit. When I decide to see a professional, I go to the N Natural Hair Studio in Silver Spring, Maryland. Patience. 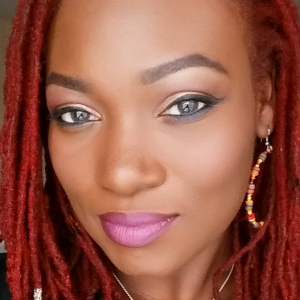 I’ve had several attempts at locs before succeeding this time around. When my hair wouldn’t loc fast enough, I’d get frustrated, think I was doing something wrong, and start over. 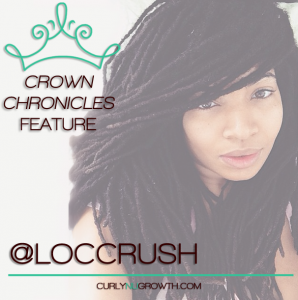 I’ve learned that the loc process is a natural progression and the timing is individual. My hair took a long time, to me, to loc. I’ve learned to be patient thru the budding stage and the ugly stage and the short locs stage. I don’t use many products. I prefer all natural ingredients that are safe enough to eat. 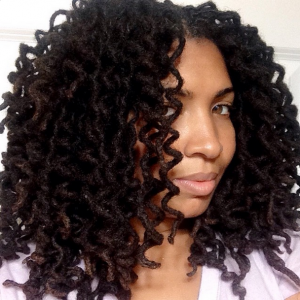 I make my own flaxseed gel to retwist and use coconut oil for moisture. I’ve always wanted to loc my hair. Having Sebborheic Dermatitis, my scalp has always been sensitive to chemicals. My natural hair, as you can imagine, is very thick and took a lot of work and products to maintain. I needed a better solution, where I wouldn’t have to spend much time styling daily and could ditch the products. 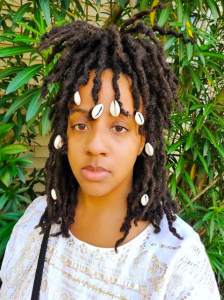 I also feel so much more connected with my roots with my hair in its natural state and having cared for it myself. Enjoy it! It’s just hair. Don’t start off the journey thinking “this is so permanent”. Let the journey lead you where it may. Enjoy the versatility of every different stage. 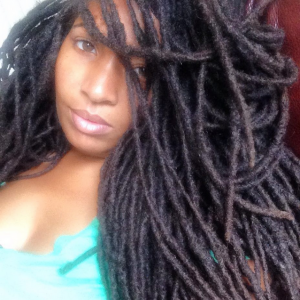 I am super attached to my locs. At this point, I can’t imagine cutting them. With my hair having grown so much over these past five years, I’m excited to see just how long they’ll get.